Spend an afternoon or evening on the farm exploring our flower fields, learning something new, spending time with your loved ones, and connecting with nature. Our 2019 hands-on workshops are accessible to all skill levels, so beginners are more than welcome in this relaxed and supportive atmosphere! All materials, supplies, and flowers are provided. My goal for these workshops is to provide you with the skills, materials, and environment to be able to learn, relax, connect and enjoy your creative process. Reserve Your Spot! Register immediately by clicking on the "Pay Now" button on each class or contact us directly if you would like to pay in cash, check, or credit card over the phone. Mark Your Calendar! We will send a reminder email the week before your class with directions. We also book private workshops if you are looking for something special to do with your friends, family, co-workers or wedding party. Please contact us to inquire about scheduling! 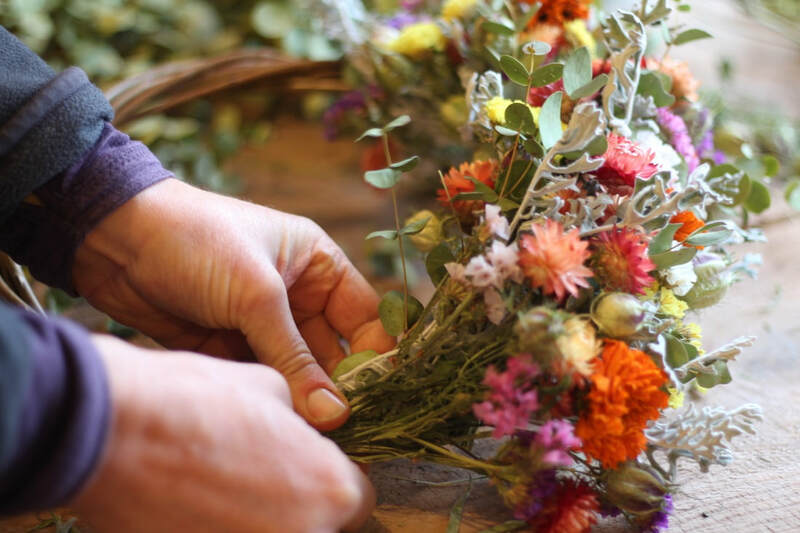 Celebrate spring and motherhood with a creative afternoon of flowers at Wild Rice Retreat! We will be designing a beautiful lush arrangement using a bounty of fresh picked spring blooms from the farm. Melissa will provide design demonstration and instruction, and offer individual assistance as you create your own arrangement to take home. All skill levels are welcome in this relaxed and supportive atmosphere. Make it a date with your mom, daughter, friend, or yourself! All materials, tools, and flowers will be provided. Join us to explore the flower fields, gather your own seasonal flowers, and make an arrangement to bring home. We will talk about the basics of floral design and demonstrate putting together an arrangement. You'll be set loose in the flower fields, free to gather whatever colors and scents inspire you for your arrangement. There will be lots of opportunity for questions/answers and to learn from each other's creative masterpieces. What to Bring: Clothing and shoes for the farm, flower snips or scissors if you have them (we will have a few extra), your favorite vase or container for your arrangement (we will also have a few extra). Celebrate the fall harvest by learning to make a beautiful fresh flower crown! We will demonstrate the mechanics of putting everything together and talk about which flowers are best for crowns. We will roam the flower fields, gathering flowers to bring back into the workshop to make your own crown to take home. What to Bring: Clothing and shoes for the farm, and flower snips or scissors if you have them (we will have a few extra). Gather with us to learn to make a beautiful and long lasting dried flower wreath. We will demonstrate the mechanics of putting everything together and have several examples to guide your inspiration. You'll be able to choose from a wide selection of dried materials that we grew and dried specifically for use in these classes. With care, your wreath will last for years. Light refreshments will be served - bring your own wine if you'd like! What to Bring: Flower snips or scissors if you have them (we will have a few extra). Celebrate the winter season by learning to make a fresh evergreen wreath to enjoy in your home this season. We will demonstrate the mechanics of putting everything together and provide a variety of evergreens, as well as other seasonal tidbits and dried flowers for you to add a special touch to your wreath. Light refreshments will be served - bring your own wine if you'd like!